Last year, Alpha had the chance to give a little back to students in the field of Architectural Design, Construction Science and Technology through the Dallas Chapter of Construction Specifications Institute. The Dallas CSI Foundation was able to award undergraduate scholarships to 113 students in 2013. CSI hosted the 2013 Charlie Joyner Golf Classic, a sponsored event, and Alpha was a sponsor. Benjamin Franklin once said, “An investment in knowledge pays the best interest”. Alpha is thankful for the opportunity to sponsor and contribute to the cause that CSI has supported and made their mission. Just about a ½ mile north of I-30, in Royse City, there is a great spot to satisfy your need for caffeine. I always need a new spot when working out east of Rockwall, and this one fills the bill. The Well Coffee Lounge is quiet and serves good & hot coffee. Feeling adventurous? Try The Well’s Candy Bar specialty coffee, even though it should send you straight to the treadmill to work it off. Need something with a little more substance? Try the scones (heavy & tasty), or grab their version of the panini – “WELL NINI’S,” which come in breakfast and lunch varieties. Historic Old Town Royse City also has some old town attractions to help walk off that “Well’s Candy Bar”. At Least I’m Not Last! Alpha is forming a team to participate in the Dallas Center for Architecture Form Follows Fitness 5K – All in support of the Dallas AIA. Our goal is to have 50 participants from Alpha Testing this year, so sign up now! Bring your spouse and your kids too. The BEST part? It’s FREE for you Alpha folks that want to register, get in touch with the Corporate Development staff for assistance. T-Shirts will have the design shown here, for your Alpha Testing team shirt, email Marianne your t-shirt size after your register. New to Alpha’s Houston geotechnical group, Sunil Sirigiripet, says that “Geotech runs in his blood”. The apple doesn’t fall far from the tree, as Sunil’s father was in construction, and initially gave him a passion to study geotechnical engineering. In 2004, Sunil graduated from, “Jawaharlal Nehru Technological University Hyderabad”. After graduating, he wanted to see how theory works in the field, becoming a Site Engineer at a steel factory in India. Sunil came to the United States to complete his Masters degree at “University of Texas at Arlington”, and has co-authored two publications for Geo-Congress 2008. His hobbies include hunting, horse riding and seeing the great outdoors with Sam and Charlie, his two dogs. The 2014 Geo-Congress is February 23-26, 2014 in Atlanta, Georgia. Adam “Kill Joy” Heimann managed to squeak out a win in the San Antonio office football fantasy league competition, proving that engineers play as hard as they work. Not sure from where his insight comes, but he is on to SOMETHING – could his newborn child be making the picks each week? The next challenge will be March Madness 2014. 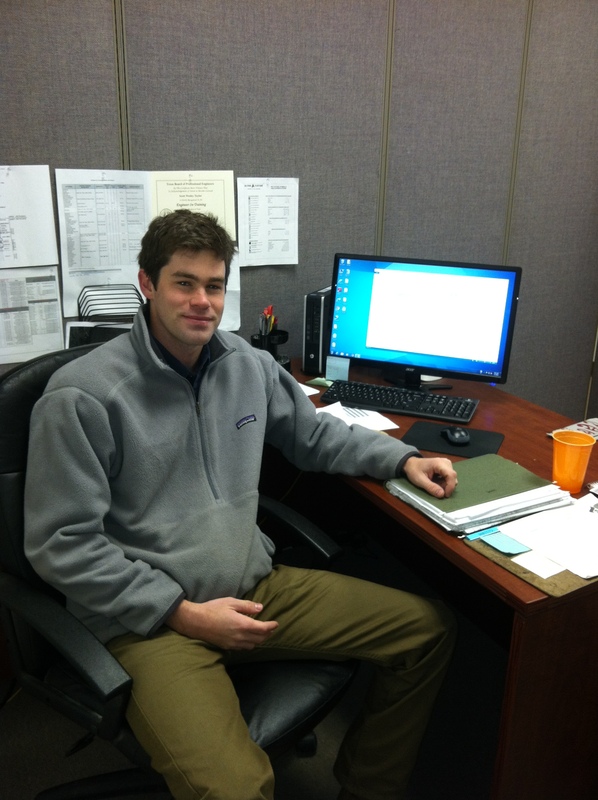 Our newest employee comes all the way from Charlotte, North Carolina (Quite a change of scenery from Dallas). Scott Taylor, EIT, first came to Texas to study Civil Engineering at SMU (Go Mustangs! ), but just like the rest of us, he realized that Texas is the place to be! He enjoys sailing, sports and playing the guitar. Axel, Scott’s black lab is back in North Carolina, and missing his friend. You might catch Scott on the weekends watching the Carolina Panthers or the Charlotte Bobcats (soon to be Charlotte Hornets).